A while back one of my girlfriends asked me about apple butter. She shared the same frustration so many of us have with supermarket foods: the store options all contained High Fructose Corn Syrup. I felt naked, y'all. Because while I do have significant square footage designated to canning equipment and supplies - and I may lose my redneck license for admitting this - I'd never actually made apple butter. But I'm game for anything in the kitchen, so we quickly decided to conduct the experiment together. Which turned into making it a great big thing with half a dozen girlfriends, which turned into a comic opera of planning and procurement. Not that any of us minded. Countless people asked for the recipe at the time (and since - can't believe it's been 3 years). The catch was that we experimented with multiple versions across multiple batches, so it took a while for us to taste them all and decide which version we preferred. Now that we've finally eaten our way through all 94 jars and I put this year's apple picking on my calendar, my thoughts turned to the pile of apple butter post-it notes stashed in my recipe binder. This is the 100 pounds of apples that made our first 94 jars. (1) I recommend sourcing your apples like this. 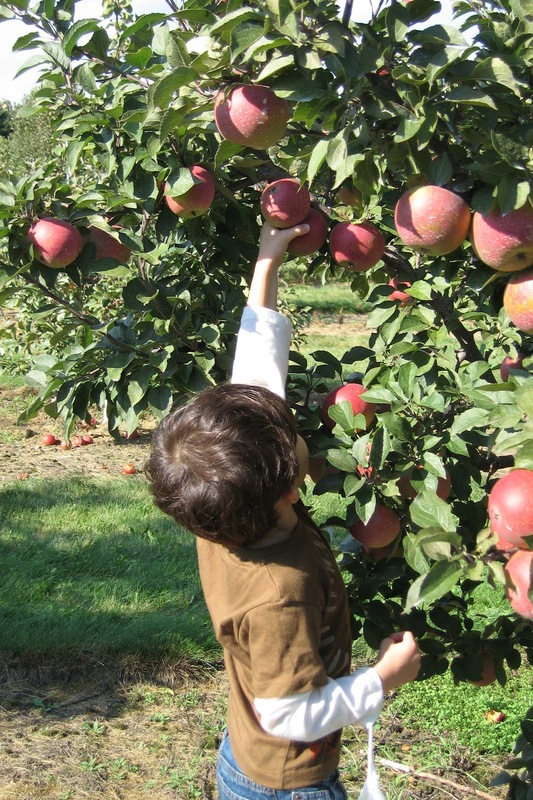 But if you don't have a small child to provide free labor, your local orchard and/or farm stand will be happy to sell you bulk apples. Many will offer a steep discount for a bushel of bruised specimens, which is ideal for this application. 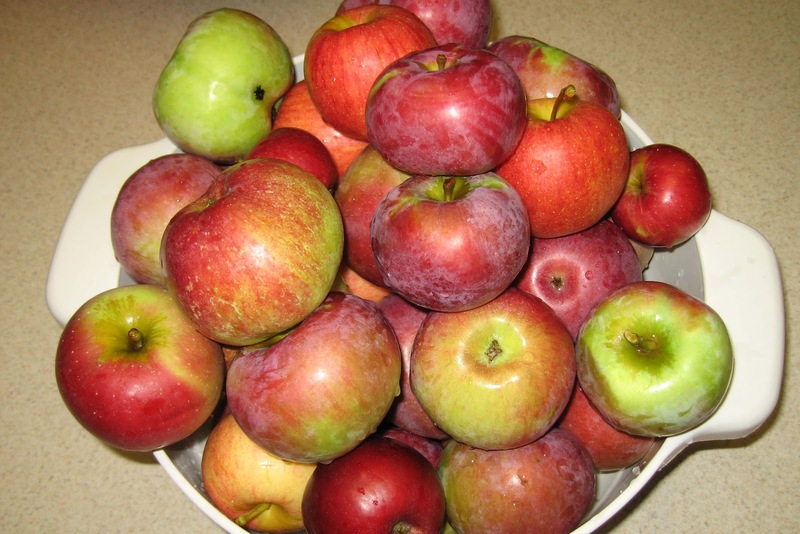 (2) To ensure a well rounded flavor profile, get several varieties of apples. Most orchards post a chart of which apple varieties are best suited for which culinary applications. Here's an example - but varieties vary by region, so check your local sources. (3) You can manually peel, core and slice your apples if you don't plan to do this very often. 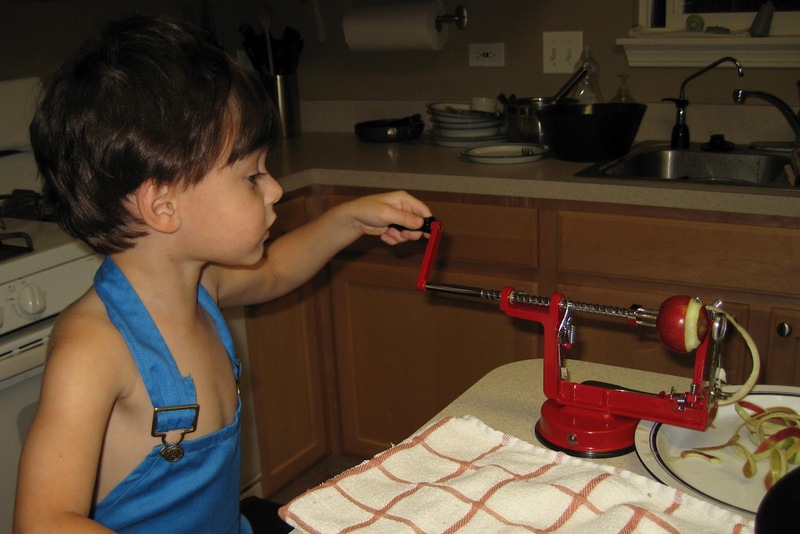 If you work with fresh apples on a regular basis, I strongly recommend getting a hand crank apple peeler/slicer. I got this model at my local Meijer for $15, and it was worth every penny. 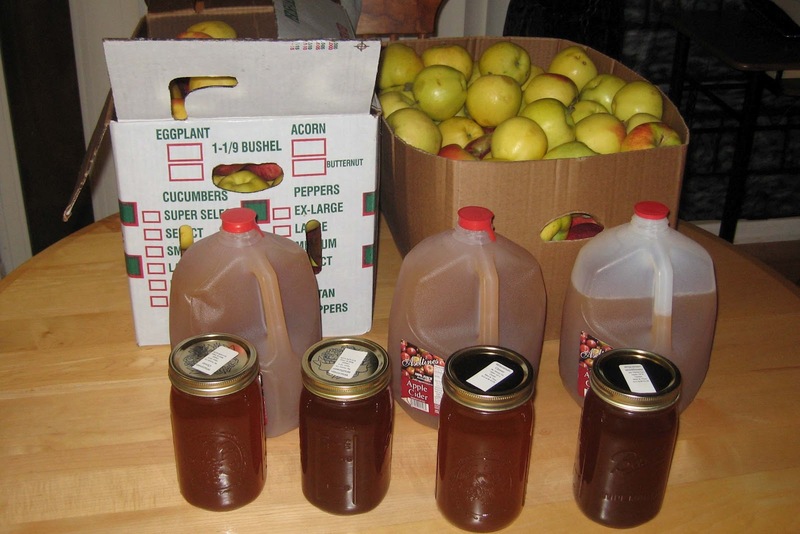 (5) Look around for an apiary - you'd be surprised how easy and affordable it is to find fresh, local honey. The one near us charges by the pound - we just bring in our own mason jars and stick them under the tap. (6) These spice quantities are based on apple butter of average (thick applesauce) consistency and is well spiced. If you prefer less bold flavor and/or plan to reduce to a very thick consistency, simply dial back on the honey and spice quantities. (7) You wouldn't go to all this trouble and use canned nutmeg, would you? I didn't think so. Not sure where to find the real stuff? I get it from the Atlantic Spice Company - it's a great price but enough to last a lifetime, so you may want to coordinate with friends. I never cease to be amazed how fast the "silly apple machine" works through 10 pounds of apples. 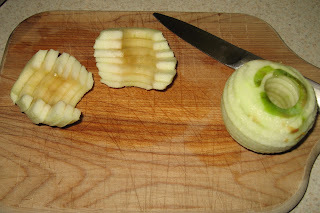 Even hampered assisted by my awesomesauce sidekick, a total clutz like me can whip through each apple in under a minute. Someday I hope to get my act together enough to make apple jelly from the peelings... but that's another episode. No problem if the apple goes on the crank a little crooked and a few seeds get left behind - just clean it up a bit before you drop it in the pot. I like to cut them in half just to facilitate the fruit breaking down, but it isn't really necessary. Took Bear school shopping because he insists on growing out of his pants. While we were at Target I remembered he'd also outgrown his bike helmet and has been talking about taking the training wheels off, so we popped back to the sports section. The helmets are next to the seasonal stuff, which means school backpacks. I was on the fence about getting a new one, so I figured we could take a peek. The Bear friendly options were impressive and he was predictably changing his mind every 4.2 seconds, each time pronouncing the next choice his "very favorite." There was a brief discussion in which I cited Dora's annoyance factor as criteria for excluding her as a backpack, but he mostly focused on what you'd expect. And that was it. End of discussion. 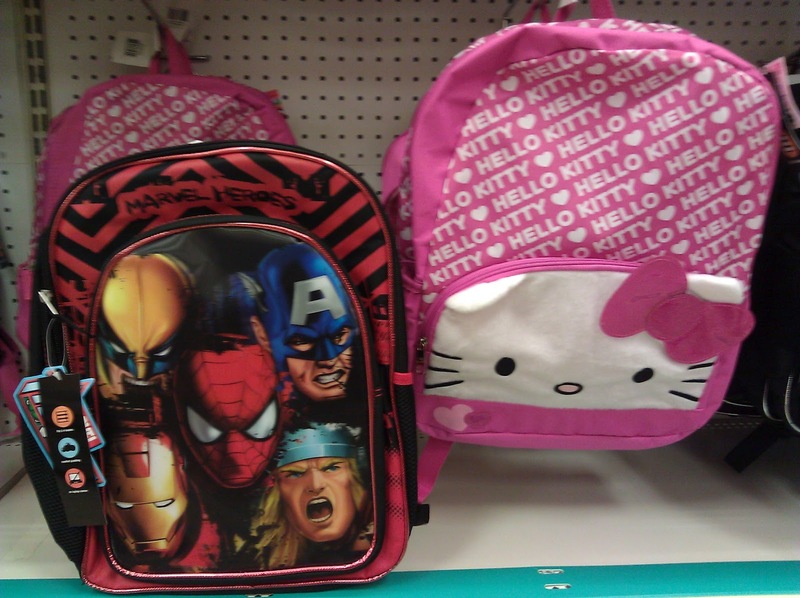 He wants the Hello Kitty backpack. - I do not care if he wants a pink Hello Kitty backpack. I will happily get it for him. - It is the same price as the Avengers backpack, so there is no good reason not to get it. It's important to note that in addition to the Avengers (his current passion), he passed up Lightning McQueen, Mater, Hot Wheels, Spider-man and (OMG!!) Mario. Mar. I. O. A subject about which he is so passionate he has stopped people on the street to soliloquize. Bottom line: I stalled and told him we could come back another day to get it. The old, naive me would have simply purchased the backpack, believing kids this young won't care about brands or colors or who has what character on their stuff. That was before I witnessed his first day of Pre-K last fall, when the boys in his class greeted him for the first time by grabbing his shoulders, spinning him around and inspecting his backpack. It's a Buzz Lightyear backpack. Which was, apparently, cool enough for them. The grabber made the announcement, the other boys indicated their approval and Bear was integrated into the line for the walk into school. After picking my jaw up off the sidewalk, I went home a thoroughly disillusioned mommy. Which brings me back to this dilemma. I love that my Bear asked for a sparkly purple superhero cape with a rainbow on it - we talked to his insanely talented godmother and she made one to his exact specifications. He wears it daily. I love that when we were clothes shopping he asked for a ruffled shirt featuring a skull wearing a pink bow. And I find it absolutely adorable he selected a Lightning McQueen bike helmet, then proceeded to beg for the pink and purple Disney Princess bike horn. But I do not love that kids are cruel. And now I know that - in a classroom where they're encouraged to wear sweatpants (because not all have motor skills for pants/are potty trained) and old shirts (for messy sensory activities) - the kids have apparently settled on backpacks as status symbol. Plus... I am frugal. I don't want to be buying another backpack if he changes his mind again in a week after getting his feelings trampled by his peers. I'm just so worried about his fragile 4 year old emotions. Because at the end of the day my big, bold, holy-crap-can-you-please-be-quiet-for-10-seconds kid is incredibly sensitive. One whom at just 3 years old said to us once after we raised our voices in angry frustration, "you hurt my heart." So what do I do? Do I practice what I preach - that all colors are for everybody - and let him have the pink backpack? Do I choose to make him happy now but risk his pride over a utopian principle? I was planning to save my indoor sensory activity posts for winter, but it's been triple digit heat indexes around here lately and I find myself scrambling for indoor activities just as much as when it's cold. The only real difference when it's too hot to play outside is that the dog doesn't track snow in on his 473 trips in and out the door begging us to throw the frisbee. 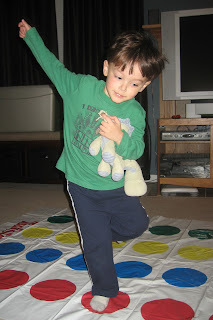 We came up with this game about a year ago, when Bear was a bit too young for formal game play. Rules and taking turns aren't any 3 year old's strong suit anyway (now that he's approaching 5 we've got a whole new problem, because he understands rules and his adorable little autistic head will explode if he thinks you broke one). 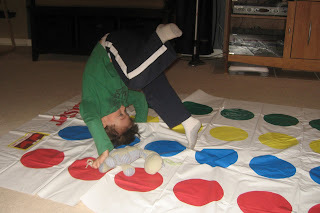 Basically, we get out the Twister game and make up our own active options to replace the static ones. I tried to think of things that worked on his specific motor planning issues and provided some of his favorite sensory inputs. 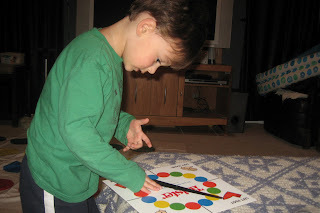 He was really excited about the spinner and knew all his colors at this point, so it was easy to get him going. Some of you may recognize the plastic inflatable pool in the background from the Pit Ball Wading Pool sensory activity post. I swear that's not a permanent fixture in my living room. This one is hopping on one foot down the row of the color on the spinner. This one is somersaults - he had just learned how to do them and was so proud of himself for going straight down the dot line. You get the idea - sit on the couch, preferably with a refreshing beverage, and make up ways for the kiddos to wear themselves out on the Twister board.